You’re out with your dog “Buddy” on an afternoon walk when all of a sudden something darts by and catches his eye. The physical connection between the two of you (the leash) slips from your hand and he’s gone. He is off and running faster than you can catch up and this thing he is chasing is much more interesting than you and your desperate calls for his return. Out of breath you stop but “Buddy” is gone, out of sight and a hole in your heart opens up and fills you with panic, confusion, and fear. “Where did he go and how will I get him back?” This is one of the most dreaded pet parent’s scenes and we hope you never have to experience anything like it. I, personally, know this feeling but replace “Buddy” the dog with Cecil, a Quaker Parrot, who is young, fully flighted, and now in a tree 100ft from the ground. I was terrified, I felt like the worst pet owner in the world. How could I, a pet professional, be so careless? Fortunately, with a lot of Etobicoke neighbourly support and reassurance from our local “bird lady”, Cecil managed to be reunited with his human flock after many tears, a sleepless night, and his desire to return. Needless to say, I have learned a lot from that experience and I wish to share some tips and advice to help prevent or manage this scenario if it happens to someone else. 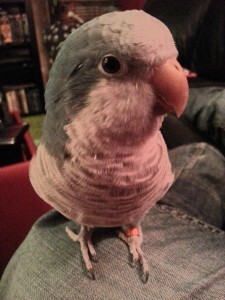 – Attach a tag with your pet’s personal information. These are available at pet supplies stores and over the internet. Have you noticed that this tag we give at your pet’s Annual Examination/Vaccination visit has a number and QR code? When you register this tag at www.soslostpets.com you can create a profile that will be linked to that individual tag. If your pet is found, the finder can use a smartphone to scan the QR code. The finder is then given options for contacting YOU. These options are customizable by the pet guardian when the profile is created. This information can be as detailed or as limited as the user would like. You can have Royal York Animal Hospital as a contact or you can add every single member of your family. Medications and health concerns can be added to your pet profile and there is also an option to be emailed with the finders location if the QR code is scanned. This is a complimentary service and is well worth the registration effort! – This rice sized chip is injected under the skin at the back on the neck of dogs and cats and provides a tool for permanent identification. The chip itself is encoded with an unique number that relates to a database. This database stores your pet’s name and description as well as your personal contact information. 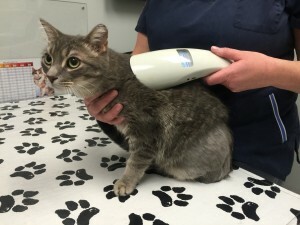 – If a pet is found and brought to Royal York Animal Hospital or most Veterinary Hospitals or shelter, the staff are able to use a scanner that is able to read the number encoded on the chip. 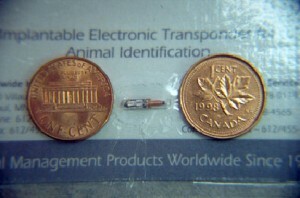 – If your pet is not microchipped – WHY NOT ? Ask us to do this simple procedure next time your pet is at Royal York Animal Hospital OR bring him in specifically for this procedure and one of our Technicians can do this while your wait. IMPORTANT: DON’T FORGET TO UPDATE YOUR CONTACT INFORMATION IF IT CHANGES (i.e. you move, get a new phone number, change your last name, etc.). 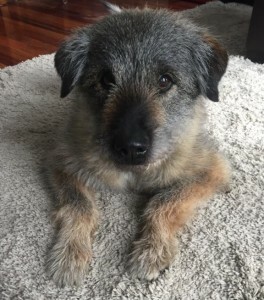 Several times a Pet has been found and a good samariton has brought him into Royal York Animal Hospital only to find that the contact information on file with the chip company is outdated. – Often cats will stray within a 3 house perimeter around their home base. Cats also like to hide in garages and under cars, so ask your neighbours to check theirs and check yours too. Dogs are often found down the street from where they live. Call Toronto Animal Services: 416-338-PAWS. And call AGAIN. – As a general rule, anytime a pet is lost or found it is your responsibility to notify the city. They truly are a wonderful resource for animal care and welfare and should be a first line contact for veterinary hospitals and shelters. Register your pet with www.helpinglostpets.com. – This is another complimentary service that owners can use to create a lost pet profile. The site also offers services that allow users to send out emails, post their pets profile to social media, create lost pet posters, and get the word out that your pet is missing. Contact local shelters and veterinary hospitals. 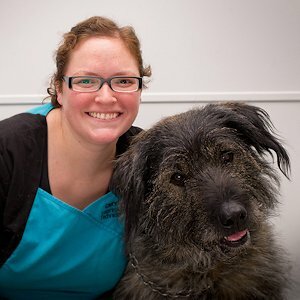 – At Royal York Animal Hospital we keep a log of lost/found pets in Etobicoke and Toronto. 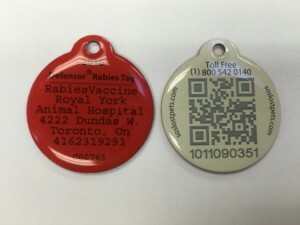 We are also able to use the number on a rabies tag issued by us to locate a pet in our client/patient database. – There is always a story floating around of a lost pet that is reunited after years or being miles away from their family. Sometimes, despite our best efforts, pets are unable to make their way back home. The best hope is that we are able to find some closure to the situation. Pets can succumb to the hazards of the street or be rehomed with another loving family, we hope for the latter. Take these harsh lessons and move on. Offer that love you shared to another, visit your local shelter and bring some joy to a pet in need.